Had an idea for the cover of a book. This is the very rough, "do I even have a workable idea here?" sort of a start. 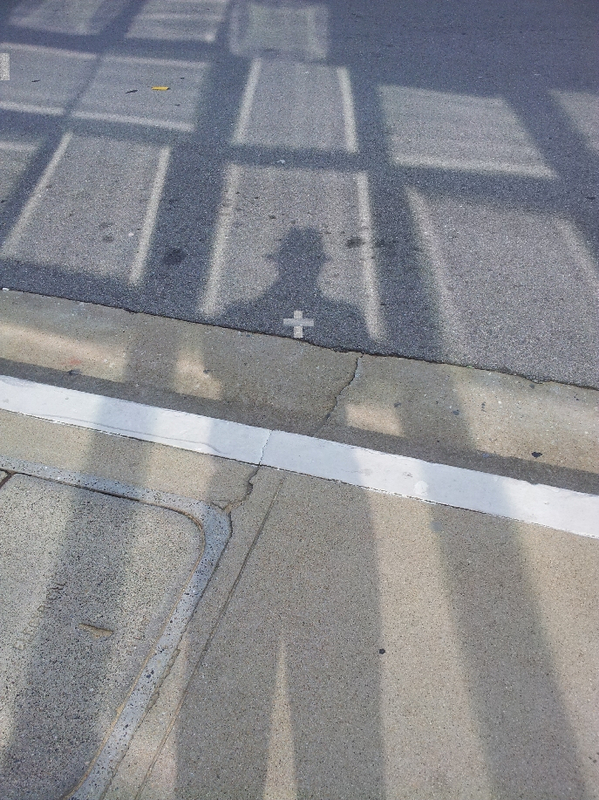 The concept here: The person's shadow reflects the cross. Yes, that's an idealized view of Christianity, and no, it's not ironic. 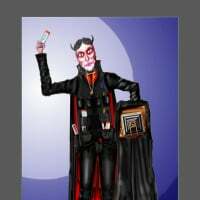 I wanted to bring in realistic elements to emphasize that it's a real-world, practical, person-on-the-street (literally) guidebook, and not a fanciful pie-in-the-sky kind of religious book. 4.) The muted colors of the pavement give an opportunity for good contrast in the Title and Author lettering. 1.) The shadow is keystoned. 2.) There's a lot of space that isn't doing anything. 3.) Aside from the obviously -inserted cross, there's nothing inherently spiritual about it. 5.) The key elements (the shadow, the heart-cross) are low in the image and small. All feedback will be received with enthusiasm. Any thoughts? One of the tests for a book cover would be to ask if you could tell what a book is about, its themes or ideas from the imagery alone. I am not so sure if this image successfully passes that...though it might come close. I don’t think that the shadow intrinsically conveys “platonic ideals outside of our knowledge.” I think you see that because you already have an intimate knowledge of the book, making the cover symbolize more to you than someone uninformed seeing it. This applies to your fourth point as well. 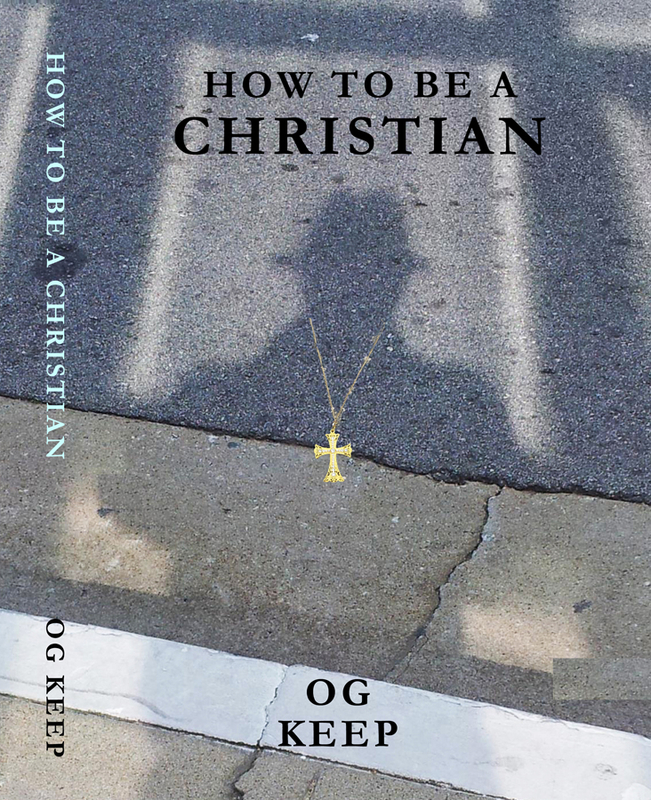 All that being said, it is still a striking image that I think might still convey the basic idea that the book involves Christianity. I think that the cross should be unambiguously a Christian cross: you don’t want people to think it’s just a starlike reflection or a plus sign. The keystoning doesn’t bother me at all: it adds drama and enhances the fact that the shape is a cast shadow. You might be able to solve your arm dilemma by taking two photos, holding the camera in a different hand each time. You could use the timer to snap the picture. In the first image, I just painted in a white cross and then smudged it. In the bottom one, I took parts of the window reflections that had strong vertical and horizontal elements, and copied them to make the cross reflection. I personally like the bottom one better. I didn't make it larger because it would go into the gutter, where the pavement color changes, but I suppose I could use a bit of the reflection in the gutter to make the lower part of a larger and more Christian cross. Then the change in background would emphasize that the cross is reflected from the person, as opposed to a mark on the pavement, perhaps. Hmm. Still very rough. Thinking towards an Easter release date, maybe. I am out of town until tomorrow. Hopefully, I can give more help later in the weekend. 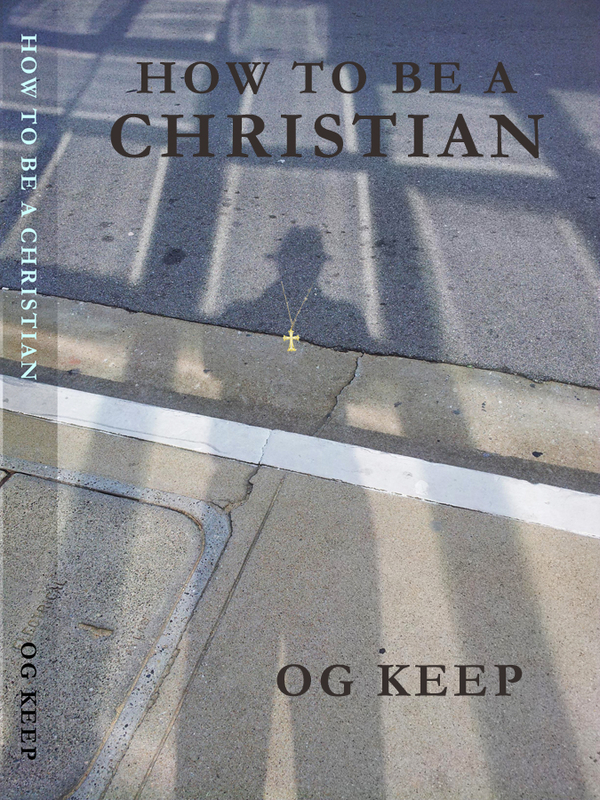 Skoob, I love your title, your author name (keeper of the faith), and I saw the first image and loved it. Then I saw the second and loved it even more. Ron is right, make the cross bigger. I would find a star of Bethlehem that looks like a cross and put it over the little cross you have in the middle. It lacks a bit of flair/flare. Just enough to show that Christianity will bring you light, glow, happiness. And it does. Good luck to you. Nice pun on Flare/Flair. I'll get out the better laptop next week with the better editing tools, and see if I can bring more emphasis to the cross, and maybe superimpose something more "Star of Bethlehem." I might also raise the contrast in the main image, more light and dark. Increasing the contrast, as you suggest, would be a good idea. I think you should try to make the cross part of the picture rather than something that is superimposed on it. 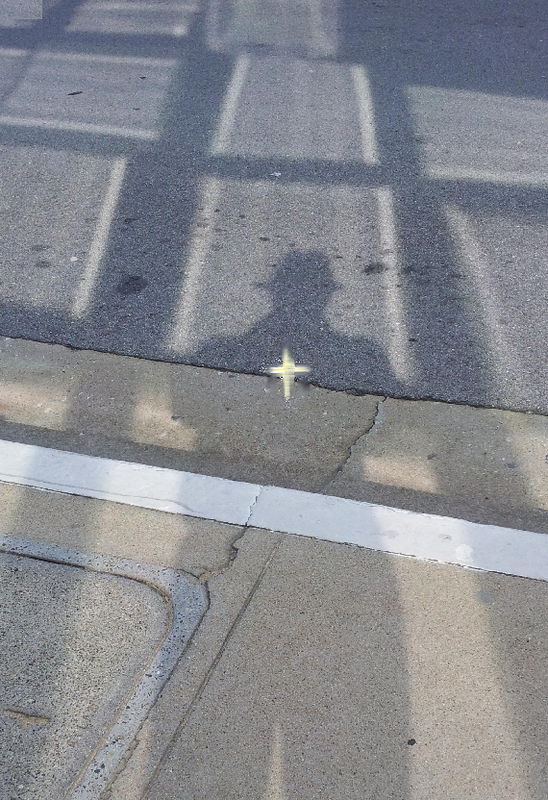 For instance, if a cross-shaped object happened to be on the street that was laying exactly over the heart of the shadow. Here's an idea that just occurred to me...Have a crucifix laying on the pavement---but a crucifix with a chain, as if it had been worn as a necklace and maybe lost. Have the chain laying in such a way that it looks like it fits the neck of the shadow. Enhancing the cross with special effects should probably be handled cautiously. For one thing, I don't think you want the cross to appear to be floating in the air, separate from the background or totally disconnected from it. Remember that the shadow and pavement---even with the contrast enhanced---is going to be fairly subtle so far as color is concerned. The crucifix on the pavement is a brilliant idea. Try different locations for it. Near the shadow as if waiting to be found/retrieved or, as Ron says, around the shadow's neck. How beautiful. Contrast is good without all the self-publishing tells like drop shadow. Simple is in. Btw, just saw Saints and Soldiers. I think you would like it. So touching. I love that idea. If there's a sunny day this week, I'll see if I can go to that town and re-take the photo. Thanks, Ron, that's brilliant! 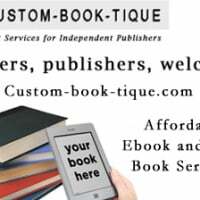 How is drop shadow an indication of self-publishing? Not in and of itself, of course. It's just one of those effects---like beveling and embossing---that tends to be overused. Like all other effects, they can be useful when the need arises. I was able to find a suitable cross on a suitable chain, so I believe I'll be able to re-shoot this Thursday. Tomorrow both weather and logistics are against me, but Thursday should work on all fronts. The evening sun has to hit those particular windows at a low angle to make the necessary reflections. Exactly! It’s just that many do-it-yourselfers will tend to use every effect available apparently just because they are there. imho, the effects often used by DIYers might work better if they were more subtle. I have yet to find a smudge tool that lets you erase a line without looking smeared. Admittedly, a smudge tool is for smudging, not erasing, so it’s probably not too surprising the result is a smear. Maggie's comment made me think, it's a bad habit I know. Again I looked at all the books I own and drop shadows are used quite a lot, but not always as 'shadows.' The effect is often used to create that 3d effect one often sees by having the 'drop' close to each letter and solid, and a different colour of course, or to best effect a darker/lighter shade than the letters. So, the sun was uncooperative today; by the time the sky was clear, the angle was too low to get the reflection. Trying again tomorrow. And I resisted the urge to use drop shadows. Ron, what I mean by "erase a line" (perhaps my terms are wrong) is to make an edge into a gradient or smoother transition. You see where I adjusted the background of the spine stripe to let me have better print contrast. If I wanted to make the edge vanish where the spine stripe meets the front cover, my first (but wrong) impulse would be to reach for the smudge tool. I can tell you by experience that it only makes it worse. Skoob, I would make the image larger so his head is closer to your title, lower title a bit. Play with different subtle fonts, white title maybe. Og huge on one line, centered, Keep under it, aligned. I think you're 80% there. Your own cover has to stun you, like wow, I did that? Others have to freeze when they look at it. I think you need more contrast between the title and the background. And considering the strong vertical symmetry of the cover the off-center author name looks odd. You may want to try to get your arms visible. I know you have the problem of having to hold the camera, but there may be ways around that. I don’t know if I would worry so much about the spine since it is unlikely that anyone is ever going to flatten the book out. But if you want to soften the transition between the darker spine and the cover, don’t darken the art itself. Create a layer and, with the rectangle tool, make a rectangle over the spine. Fill it with black and then adjust the opacity until it darkens the underlying image the way you want it. Then apply a soft blur to cut the hard edge. When looks right, merge the layer with the background. It's coming along, but I think that the shadow is too elongated. Akin to what Maggie suggests, if you shorten the shadow, then the head, and the cross, could be larger. The cross seems to be the most significant part of the image, but currently it's a bit small. Oh, what seems to be a type of manhole cover is a bit distracting also. I agree with Maggie and Kevin that the shadow could be larger and less elongated. When I first took the original picture, I wanted to get as much as possible of the pattern of the light. Reshooting will let me be more precise and still keep high DPI. I'll try it again today, going for a tighter image. The cross blended much more easily than I had expected it to. Still, if I can shoot it as one shot, that would be better still. I'll work on title contrast and author name position when I get home this evening. The pattern of reflected light is very nice, but the shadow is really the most important thing on the cover so I would work hardest on that. Well, long story short, the reshoot did not go well. The original was taken at a different time of year, the sun was partially obscured, and when I did have good reflections, there was a truck parked in the loading zone.